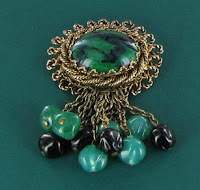 This is another chapter in my ongoing series about various aspects of vintage jewelry. Today we'll discuss how to shop for vintage jewelry, how to value it and where to start in your search. The prices on vintage jewelry are not static. They change with the passage of time, and they also change with current trends and popular designers. A few years ago, I could pick up Trifari pieces relatively cheaply. Now, even on ebay, the prices of good pieces are very expensive. It appears the Italians want Trifari jewelry back in their country and they have discovered the internet for jewelry buying. 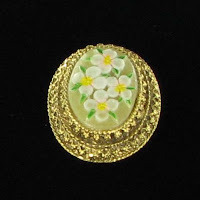 There are lots of places to aquire vintage jewelry. eBay has a fantastic range of it. But be careful. Although there are undeniably bargains there, there are also many pitfalls. Many sellers do not use good clear photos of their jewelry and may have undisclosed faults that you won't discover until you have paid for the item and have received it. Also, you may have a big cleaning program in store for your piece. Many sellers on ebay do not clean their jewelry at all. So, buyer beware. Choose your sellers wisely, ask questions when you are unsure, and know your values. I prefer to use ebay as good place to see how the market values jewelry. You can search completed listings for two weeks for your search term and get a good idea of what certain designers and types of jewelry is going for. 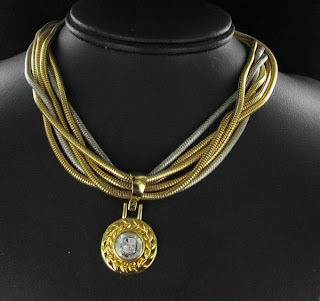 It will give you a very good idea of the "wholesale" price of vintage jewelry. 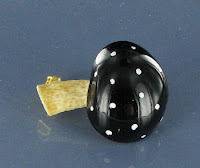 Going to live auctions can often result in wonderful jewelry finds. And don't forget flea markets and antique shops as you head out for vacations later this summer. These are all good places for vintage jewelry. Scour the local papers for news of upcoming auctions. Often they will tell you whether jewelry will be part of the estate. If you don't mind doing the leg work and then polishing and cleaning the jewelry, all of these could be means for procuring jewelry. If you don't want to do the legwork and the cleaning process, then you usually will have better luck with quality buying from a well known and established vintage jewelry seller online. There are a multitude of vintage jewelry sellers. Some of them have been established for years, and some may be new and just starting out. You can usually find this information on their websites. Established sellers know the market well, and normally offer vintage jewelry with good clear photos and the pieces are in good condition. Always, always look for back photos of jewelry that you are buying. The back of a piece can tell you many things about it (including fakes, and undisclosed damage.) 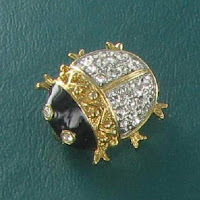 If you don't see a back of a jewelry item that you like, move on to another seller. In my experiece, it only takes a little more time to write up an add and give complete photos of it, so not putting them in is lazy at best and deceptive at worst. Now - suppose you find a vintage jewelry item that you like. There are several factors to consider before parting with your money. Do you have a good idea of the current market price? Is the jewelry clean and in good condition? Is the jewelry piece a "book piece" featured in some of the popular vintage jewelry reference books? This sometimes can add value as it makes them particularly desirable. I've been trying to buy a set of the Har Coolieman jewelry for months with no luck. Every time I find them, the price goes through the roof. They are a much sought after book piece. There are many extras that can make a piece of vintage jewelry worth more. Many designers made sets or parures. Is this piece a part of a set and are all of the pieces included here? Does it come in the original box? This always adds value, and particularly so when the box is in very good condition. They also indicate that the jewelry has been stored well over the years. Does it have original tags? This is a special find. Many designers used paper tags on their jewelry, when were often discarded on the first wearing. Finding original tags on vintage jewelry can easily add 20-30% to the value. Popular designers who are highly collectible will make the piece more expensive and valuable. 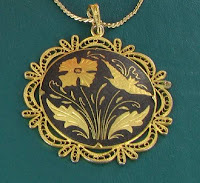 Many designers such as Hattie Carnegie, Miriam Haskell, Eisenberg, Juliana, and the like were not prolific designers, so the pieces are more rare than the average jewelry pieces. 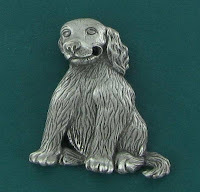 And designers such as McLelland Barclay, Boucher, Jomaz are very sought after. Armed with these facts and a few tools (magnifying glass, and loupes are helpful to see small details if you can see the piece in person), it is time to start out on your first vintage jewelry buying tip. Have fun!! All of the items pictured are available for sale on Vintage Jewelry Lane. Just click on the pictures to go to the item pages for the description and prices. This finishes the series on collecting vintage jewelry. 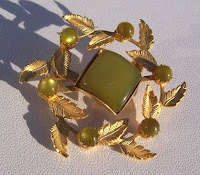 Over the next few months, I'll be discussing various vintage jewelry designers in great detail. Green grass, fresh new sprouts, leafy greens and vegetables - all of these green colors are so earthy and soothing. So, too, is the color green in jewelry. I've always thought of green as a healing color, so I just feel good when I wear green jewelry. Green is often used as an accent on enamel pins - flower pins use it as enameling for leaves, and of course red and green are used all the times as Christmas colors, and green is used by itself as a color for St. Patrick's day jewelry. So, I went on a hunt through my stores to see what I have for just plain green. It was kind of hard to find it as a single color. I kind of felt like Kermit the frog - "it's not easy being (just) green!" 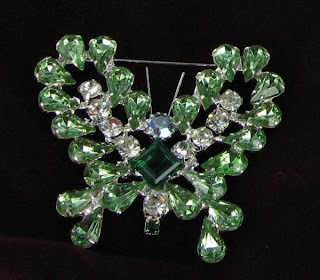 And my favorite - just in time for spring is this gorgeous green butterfly rhinestone pin. 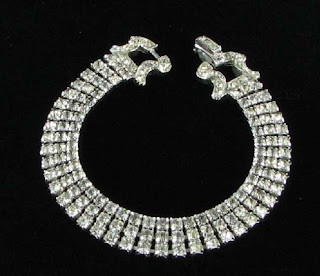 It is available in my Carolina Collections Vintage Jewelry Store for only $39.99. But hurry in - I only have two of them! Trifari is such a wonderful vintage designer. The pieces are so well made and the designs range from very simple brushed goldtone and silvertone to dazzling rhinestone creations. It is one of the designers with which I specialize on all my websites. It's always amazing to me to discover how many of the pieces are purchased by Italians - making the round trip from creation back to the new owner. I have recently aquired this new three piece parure. Full parures of vintage jewelry, especially Trifari, are getting exceedingly hard to find, especially in wonderful condition. This set appears to be almost new. The parure consists of a two strand necklace, pair of clip back earrings and matching three strand bracelet. 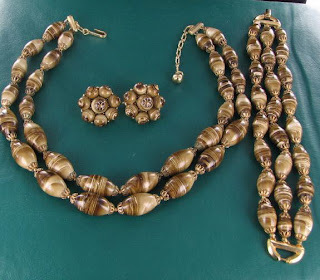 The design consists of goldtone findings and stunning earthtone colored marbled lucite art beads. All of the pieces are marked with the crown over Trifari hallmark. 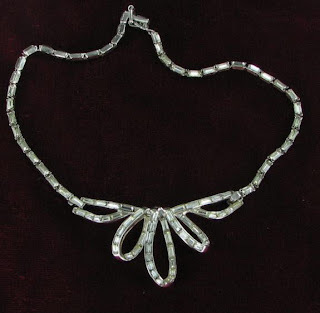 This wonderful Trifari lucite full parure is available on Vintage Jewelry Lane for only $89.99. Spring is here and it's time to spread some wings - those of the critter kind. With all the bulbs and seedlings starting to grow, now is the perfect time to wear those butterfly and bug jewelry pieces you have in your collection, or to find some new ones to add to it. Wearing butterfly jewelry lightens the hearts of those that see you in it, and makes you feel special yourself. And since a butterfly symbolizes renewal, a piece of butterfly jewelry is the perfect anniversary gift! Spring fashions are usually full of color and butterfly jewelry makes a wonderful accent. 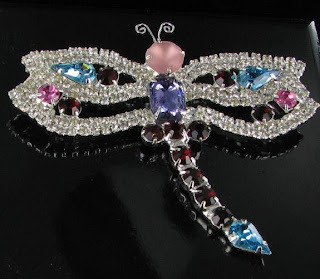 Although you can find some with subdued colors, most designers of butterfly jewelry take great delight in combining a myriad of stone colors together to make the wings sparkle and stand out. 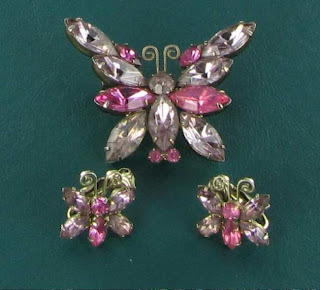 This lovely demi parure uses a combination of pink and purple - both great colors for spring, and it has both a brooch and a pair of matching earrings. It is really romantic and feminine. 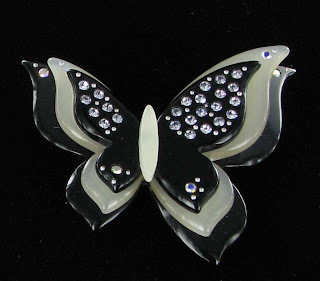 This Joan Rivers lucite butterfly pin is a good example of a combination of colors that isn't too bright and would look stunning on either a white or black jacket lapel. I love the layered look of the wings and the clear diamante rhinestones add just enough bling to make it sparkle and shine. 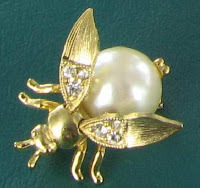 And for those of you who like a bit more of the creepy crawly jewelry - look at these unique bug pins. They should appeal to the budding entomologist in you. Just enough of a crawly look but not creepy enough to make those who see it run away. 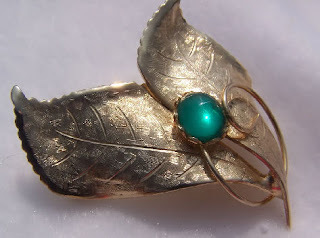 Be sure to visit the Butterfly and Bug jewelry page on Vintage Jewelry Lane which has an insect jewelry piece which will appeal to all tastes and budgets. All of the jewelry pieces featured here are available as well as many more. Spread those wings and fly!! This blog post is another in my series about choosing jewelry suitable for individual star signs. Aries is the star sign for those born between March 21 and April 19. Tomorrow starts the new star season, so today's post will help you with some jewelry choices for this star sign. Those born under the sign of the ram are said to be courageious, enthusiastic, generous and optimistic. On the negative side, they can be short tempoerd, impulsive, impatient and somewhat self involved. The flowers associated with this sign are tulips, any thorn bearing flower such as roses, hollyhock, geraniums and impatiens. Combining these ideas gives me some inspiration for jewelry for your Aries friend. 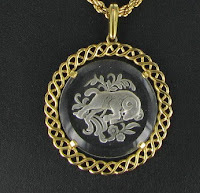 The first one that comes to mind is this Trifari Ram necklace made of intaglio reverse cut glass. It is simple, doesn't have the zodiac sign printed on it as some zodiac jewelry does and feels cold and natural on the neck. The Aries ram zodiac pendant necklace is available on my Vintage Jewelry Lane site for only $19.99. 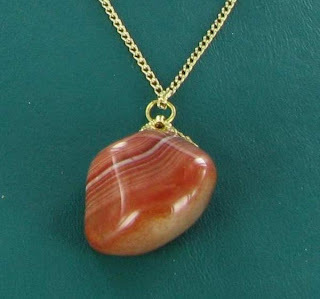 If the actual zodiac piece doesn't appeal to you, how about this lovely carnelian banded pendant necklace. 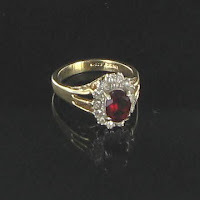 It is set in goldtone and is a lovely earthy red color which would appeal to aries personalities. 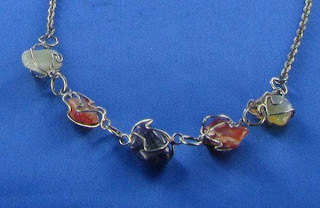 You could team it up with this stunning caged gemstone bracelet which has carnelian nuggets of the same shade. The red carnelian necklace and caged carnelian gemstone bracelet are both available in Carolina Collections Vintage Jewelry. The necklace is available for $11.25, and the bracelet is only $8.50. Want to buy a piece of jewelry with flowers on it? 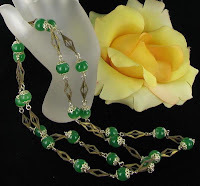 Look no further than the flower jewelry pages in my three stores: Vintage Jewelry Lane, Carolina Collections Vintage Jewelry, and Vintage Jewelry Mall. Into numbers for your Aries friend? Look no further than this wonderful 6 strand snake chain necklace with a shield pendant. The necklace is very modern looking and is marked LC on the clasp. It's availabe at Carolina Collections Vintage Jewelry for $11.99. Check back next month when I will be giving suggestions for your Taurus friend. That is my star sign, so I'll have lots of ideas. Imagine a French baguette loaf of bread and then picture it as a rhinestone or gemstone. You have a baguette in mind. A baguette is a gemstone which has been cut into a long narrow rectangular shape, and the name actually comes from the French word for this type of bread. 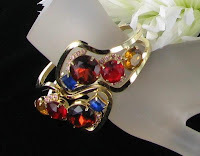 The baguette is used in vintage jewelry in both the rhinestone and glass form of stone. A variation of it tapers so that one end is smaller than the opposite end, but in all cases, it is long and narrow. The term baguette can also be used to refer to a ladies style watch which has a thin, elongated rectangular or oval face. The shape is distinguishable by its much greater length than width. Because of the slimness of it, it is usually found in channel settings, or with only two prongs - one on each end of the stone. I have also seen it simply glued in, but baguettes placed this way have a tendency to come loose, so look for channel or prong settings for them. The stones are available in both flat back and pointed back styles, so it is very versatile for all stone settings. Baguettes come in all colors and sizes, but the majority of vintage jewelry designers used the clear diamante color. Sometimes the baguettes are used alone, and sometimes there are used in combination with other shapes of rhinestones. The following picture shows a lovely blue baguette style, followed by a pair of Coro earrings with clear baguettes in combination with chatons. There is also a special finding which incorporates several baguettes in a group and encases them together so that they can be used as one piece. 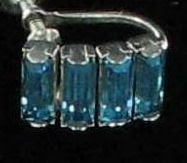 These are more often found on more contemporary jewelry. Many vintage jewelers used baguettes, but Trifari was very fond of them. Many of the early patent pending Alfred Philippe designs used baguettes and the effects were stunning. This lovely A Philippe design from 1953 is entirely made from long diamante baguettes and it is set in rhodium for a wonderful effect. This lovely Trifari Patent Pending baguette necklace is available from my Vintage Jewelry Lane site for $125.99. I've also included the patent design on the listing page for your information. 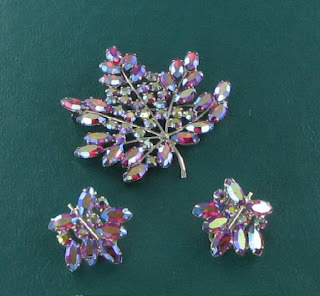 The earrings pictured earlier are also availabe on Vintage Jewelry Lane. One of the great things about jewelry is that you can coordinate it to all your wardrobe choices - and vintage jewelry is no exception. There is no need to stick to plain gold and silver; vintage jewelry comes in a myriad of color choices and they are available in all types of jewelry. 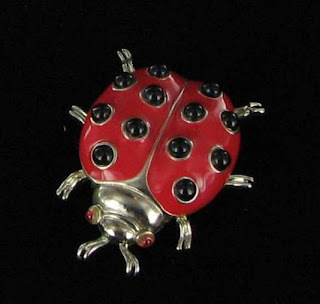 Look at this sweet ladybug figural pin by Trifari. What a perfect choice it is for spring! 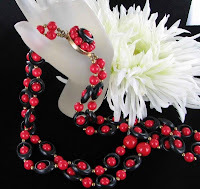 I had a quick look through my Carolina Collections Vintage Jewelry store to see what I currently have available for red jewelry. And for those of you who think red is a seasonal color. It's not. Red is not just for Christmas and Valentine's day. It is one of the hottest jewelry colors year round! Here is a small selection of necklaces, earrings, bracelets, pendants and rings - all at bargain prices. 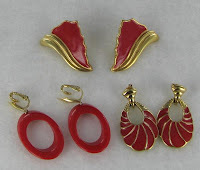 You can view these pieces plus many more from the selection of vintage red jewelry in my ebay store. 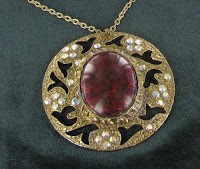 I also have lots of red jewelry choices at Vintage Jewelry Lane and Vintage Jewelry Mall. Just type in "red" in the search box on the main landing page. 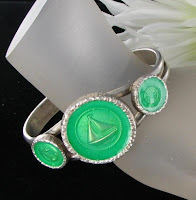 One of my favorite designers of Vintage Jewelry is Trifari. The pieces are gorgeous, well made and truly pass the test of time. The Trifari Jewelry Company dates back to 1910 when Gustavo Trifari, an Italian immigrant formed a company called Trifari & Trifari with his uncle, Ludovico Trifari. The firm's name changed over the next few years as different designers joined the company. The 1930s - 1950s was a period of high quality design when Alfred Phillipe was the lead designer. Trifari grew into the second largest manufacturer of costume jewelry, with only Coro exceeding its production. Trifari pieces are marked with several hallmarks: a crown above T, the letters TKF, or simply Trifari. Early marks can also be found with the words "Trifari, Krussman & Fishel." I have recently aquired a full set from Trifari jewelry which is just lovely. 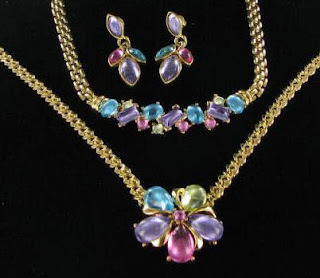 The set consists of a necklace, a matching pendant necklace and a pair of pierced earrings - all set with a stunning combination of purple, pink, blue and green lucite cabochons in a goldtone setting. And if you read my blog a few days ago about the colors for spring being forecast, just compare these colors to my chart. Even though the pieces are vintage, they are perfectly in style - as far as the colors go. 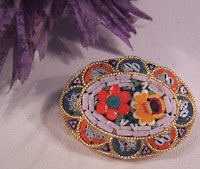 This lovely Trifari full parure is available from the Trifari Vintage Jewelry Line on my Vintage Jewelry Lane Site. Priced at only $75.99, it can be yours today! I love pearls. No other piece of jewelry seems quite as romantic to me as that which has pearls as part of the design. My favorites of course, are the genuine thing followed by cultured pearls. But vintage and contemporary jewelry designers have used glass pearls and imitation or "faux" pearls in their designs as well. Storing and cleaning pearls, of any type, can be a challenge. Cultured and genuine pearls have a nacre which the clam coats either the man made addition to it, or a parasite which has invaded the clam in nature. "Faux pearls" have a layer on the outside of a synthetic or glass bead which is meant to simulate the real thing, but is also somewhat fragile too. Cultured pearls with thick coatings are more durable than those with a thin coating, or faux pearls, but they are still more fragile than most other gemstones. This means that you must be very careful when you store, wear and clean them to keep them in the best condition possible. Be sure to put your pearls on after you have applied your perfume and makeup. Pearls attract makeup residue easily, so putting them on after you have done your make up lessens this attraction somewhat. The same goes for hand creams and pearl rings. Anything that might stick to the pearls will make it difficult to clean them later. If in doubt, follow the "last on, first off" rule with pearls of any type. When you are done with the pearls for the day, just wipe them with a soft cloth that is lint free. This will remove any slight make up residue. The cloth can be dry or lightly damp, but if it is moist, be sure to air dry the pearls before storing them. To clean dirty cultured pearls, you will need a very mild soap, like Ivory Flakes, and warm water. Never used harsh detergents, abrasive solutions, or cleaners that contain ammonia and never use an ultrasonic cleaner. You don't want to do anything which will remove the nacre. Faux pearls will especially need extra care, since they do not have a natural nacre, but a synthetic one which is applied over glass or plastic beads and this can easily pit or come away. The key here is a very short immersion in the cleaner, so that the coating doesn't have a chance to come away from the bead. 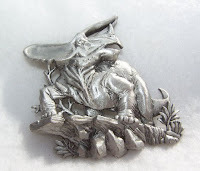 I have had good results with a product called Jewelry Joose. It is mild, can be sprayed directly on the dirty pearl or pearls, so you can "spot clean" with it, instead of immersing the whole strand. The cleaner is very easily rinsed off too, which is another benefit. Just lay them on a clean towel to dry. Be careful not to rub. You should store all pearl jewelry separately from other jewelry so that it does not rub against the delictate pearl finish. You may also find that the cord with which pearls have been strung my stretch over time and so will need restringing. It pays to do this in the case of cultured or genuine pearls, but not for faux pearls, since these are relatively inexpensive to buy. 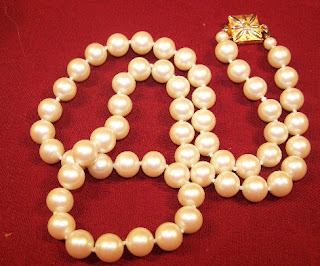 Enjoy your pearls, wear them often and use care in storing and cleaning and you will have them for years to come. Dont' have pearl jewelry yet? Check the links at the top right of my blog. I have a wide range of pearl jewelry in all three of my stores. 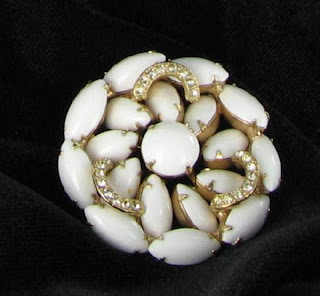 I also have more information about the topic of vintage pearl jewelry in my Vintage Jewelry Lane website resource library. As predictable as clockwork, each season, the world of fashion gets inspired by a new array of colors, and these colors are what we eventually see in stores. The color forecasts were released for Spring 2009 a few months ago and the fashion experts agree that what we can expect is a palette of colors that will bring to mind freshness and new beginnings, just as the spring flowers do in nature. This spring, the colors will be bright, as designers will try to incorporate vibrant colors, mixed with some translucent and neutral tones for balance. Many of the low key hues have been pulled from nature, and the new spring trends should mix well with existing colors already in your wardrobe. Yellow, slate gray, deep fuschia and bright blue make the top ten list, along with some softer colors such as rose pink, neutral beige and lavender. Citrus green and bright yellow seem to be some top contenders too. The good news for jewelry is that these colors are found in abundance in all styles of vintage jewelry. Be sure to check my stores for some colorful jewelry to add to your new spring wardrobe. If you use the color chart above, you can't go wrong! Spring is my favorite time of the year. The sky is blue here for a few months, with no haze and humidity which is so prevalent in the southeast US during the summer months. 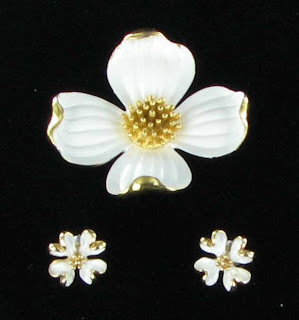 What more perfect way to celebrate the emergence of spring than with your own vintage flower jewelry. The choices are endless. Flower jewelry comes in all sizes, colors and type of flower design and you can find it in necklaces, earrings, bracelets, and brooches. Here are a few choices to awaken the gardener within you. I have a whole page devoted to flower jewelry on my main site, so these are only a sprinkling from the current garden of jewelry available to you. 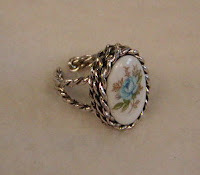 All of these jewelry pieces, plus dozens more styles, are available on the Vintage Flower Jewelry page of my Vintage Jewelry Lane website. Have fun picking your flower bouquet! A secondary line was introduced in 1986 called "Artifacts"
The shortened name of the company consists of two letters. 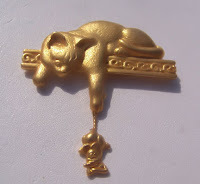 I love figural and thematic vintage jewelry - pieces with a motifs such as dogs, cats, western themes, hearts, flowers, zodiac, fruit, etc. Jewelry like this is often whimsical and appeals to a wide variety of people, even those that don't normally wear costume jewelry. My latest sale at my ebay store Carolina Collections Vintage Jewelry has a large range of figural and thematic jewelry marked down 25%. The sale includes both signed and unsigned jewelry pieces and there are all types of jewelry pieces - necklaces, earrings, brooches and pins. You can view these pieces and the other figural vintage jewelry on sale on this page my ebay store Carolina Collections Vintage Jewelry. Prices start at less than $5, but hurry in for best selection. Sale ends on March 16.